Just behind our small greenhouse, tucked between the rows of rhubarb, is a little square of garden – wild garden – that is one of my favourite areas on the farm right now. Mostly, I like it because I haven’t done anything with it this season. 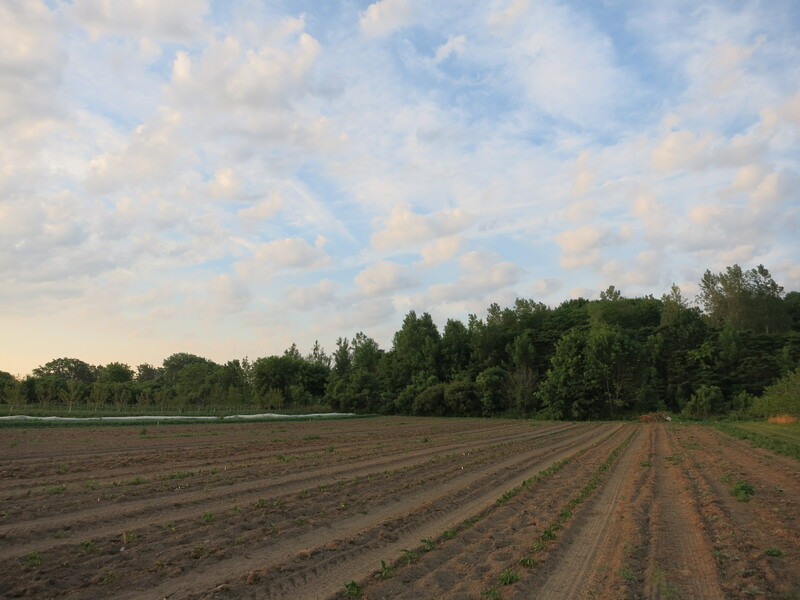 No seeding or planting, no weeding, no watering – nothing. 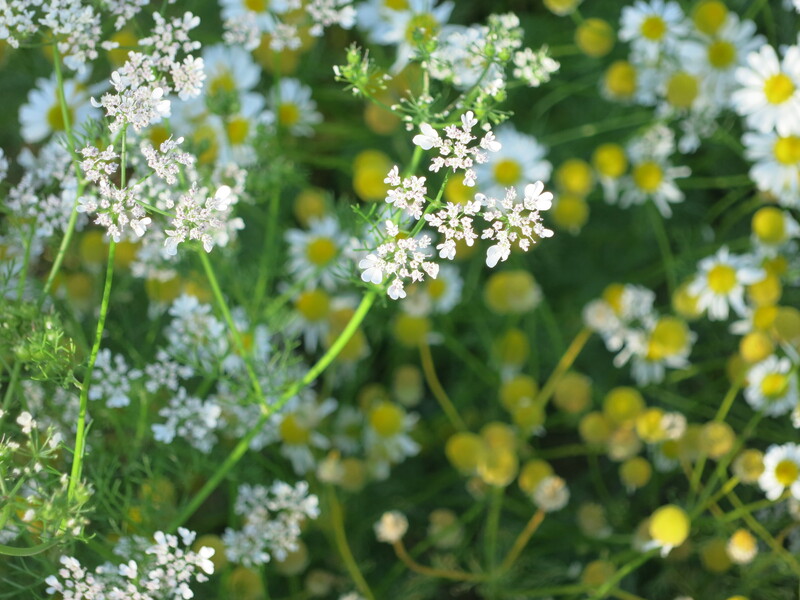 Yet it has yielded abundant crops of parsley, cilantro, dill & chamomile. 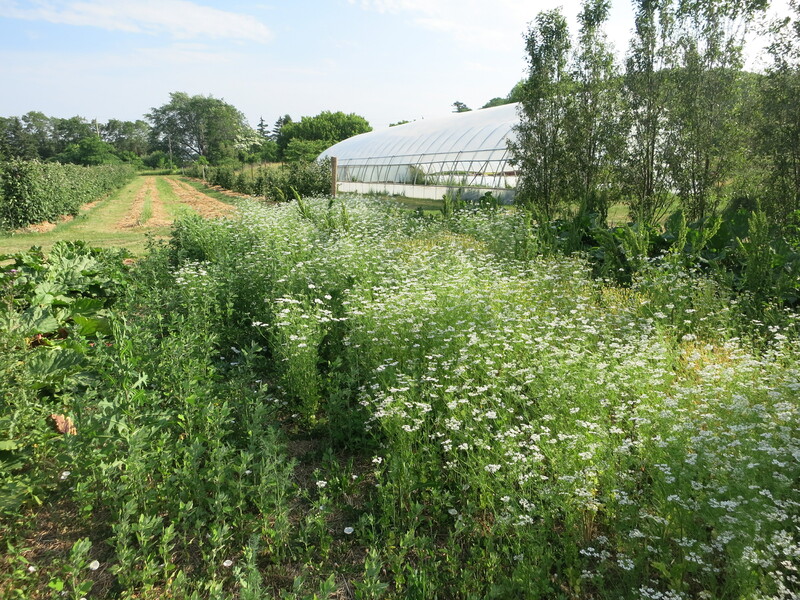 I planted all those things here last season & then left them to go to seed. As I had hoped, they all returned this year, growing lush & strong. Since early spring we have enjoyed our scrambled eggs with dill, added cilantro & parsley to our salads – all without any effort or work on our part. Now we have let it go to flower again & the blossoms are full of bees & other pollinating insects. Shortly, I’ll mow it all down & the crops will regrow again. The only downside is the weeds mixed in that are also going to seed & will return with a vengeance. If only the whole farm were so easy! The sky early this morning was beautiful – but we knew it was to be a scorcher! While we wilted in the heat, we managed to accomplish a lot. But the plants are also wilting in the heat & shriveling in the drying winds. No rain in sight! 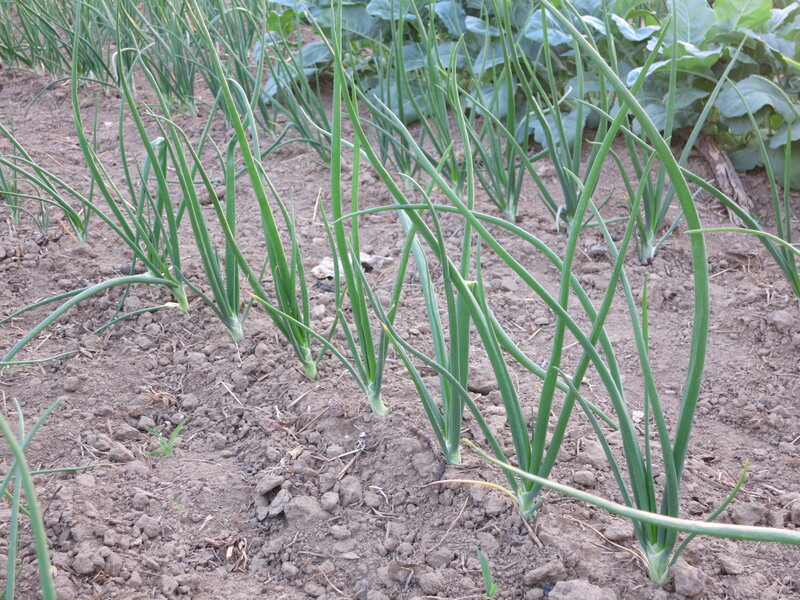 Our usually rich, dark soil has become very dry & dusty. 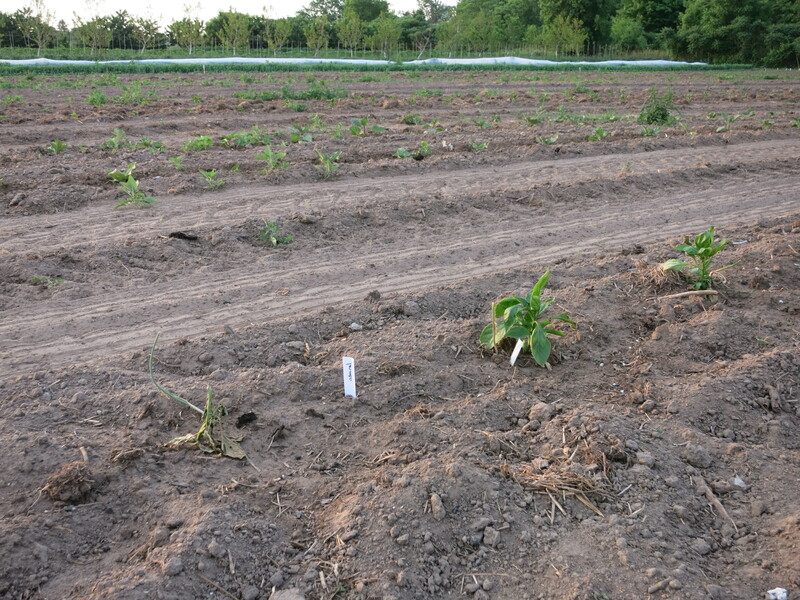 Plants that we recently transplanted into the fields are struggling to survive. Those that were established earlier continue to do well, though growth is slow & some are showing signs of suffering. 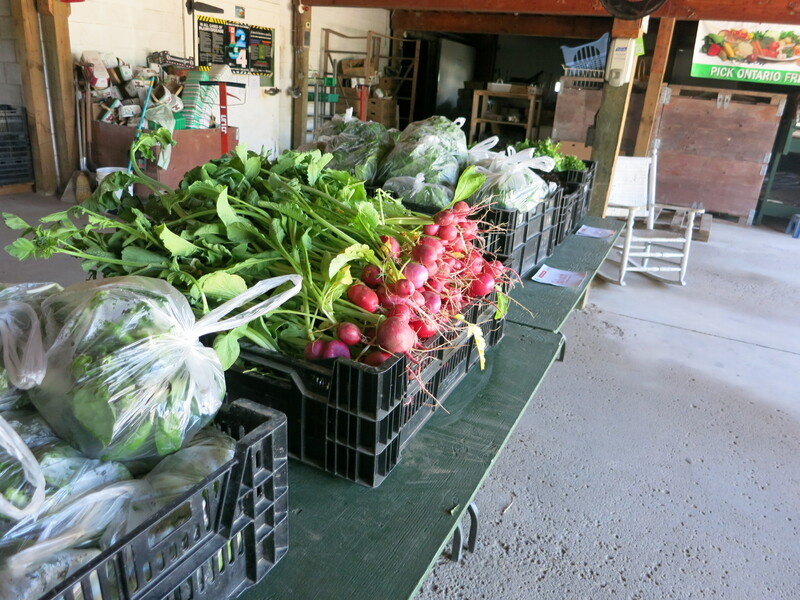 Kohlrabi, snow peas, lettuce, radishes & salad turnips. 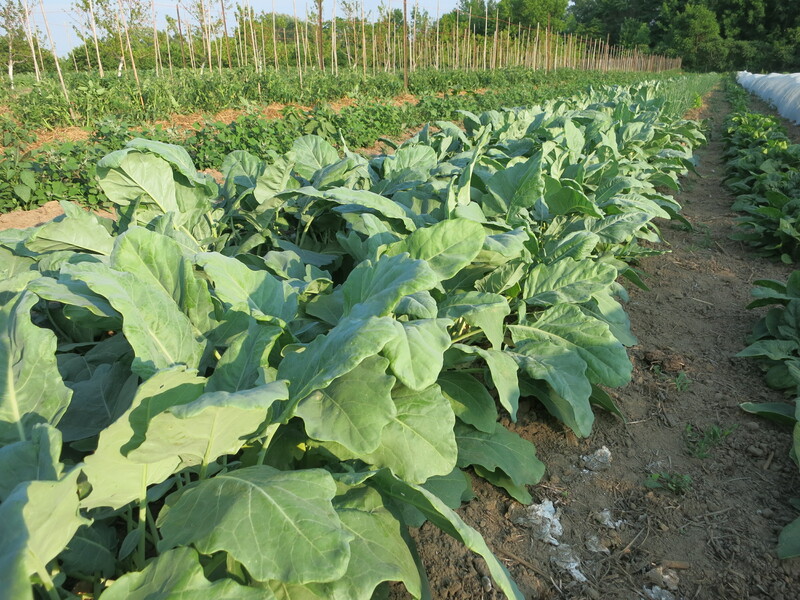 We have not offered kohlrabi in our CSA shares for several seasons – but not for lack of trying. We just have had difficulty getting it to grow properly. This season, on the advice of more experienced growers, we started it in the greenhouse & transplanted it to the field – with much success! Many people are not familiar with kohlrabi, so here’s a quick tutorial. Kohlrabi is a strange-looking vegetable – sort of like a cross between a little cabbage and a turnip. It is usually considered a root vegetable, though the edible round globe grows above ground. Kohlrabi is usually eaten raw – just peeled & sliced. The taste & texture resembles fresh, crunchy broccoli stems, with a bit of radish thrown in. Use on raw vegetable platters and serve with a creamy dip. Grated kohlrabi can be added to slaws. Kohlrabi can also be steamed or boiled but don’t peel until after they are cooked. When the bulbs are tender, peel skin, and season with butter, salt, and pepper, a cheese sauce, or just enjoy plain. They are good for mashing with other vegetables – parsnips, carrots or potatoes. Kohlrabi absorbs the flavour of other ingredients making it ideal to add to soup, stew and stir-fries. 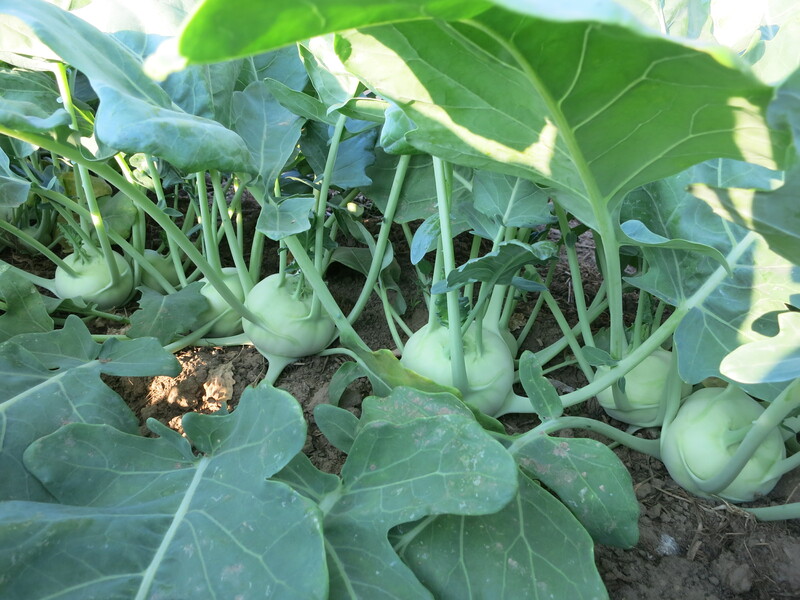 If the leaves attached to the kohlrabi bulb are fresh and green, they can be enjoyed as a cooked green. Wash the leaves and remove the ribs. Blanch in boiling water until just wilted, 3 to 5 minutes. Drain and squeeze excess water from leaves. Chop leaves, then sauté in a little olive oil or butter. Season with salt and pepper. Add a splash of vinegar or squeeze of fresh lemon juice. The bulbs should be stored, unwashed, in a plastic bag in the fridge. They will hold for about a week. Snow peas are always a favourite for our CSA members. Steam, saute, or stir fry them. Enjoy them raw in salads or just as a snack. 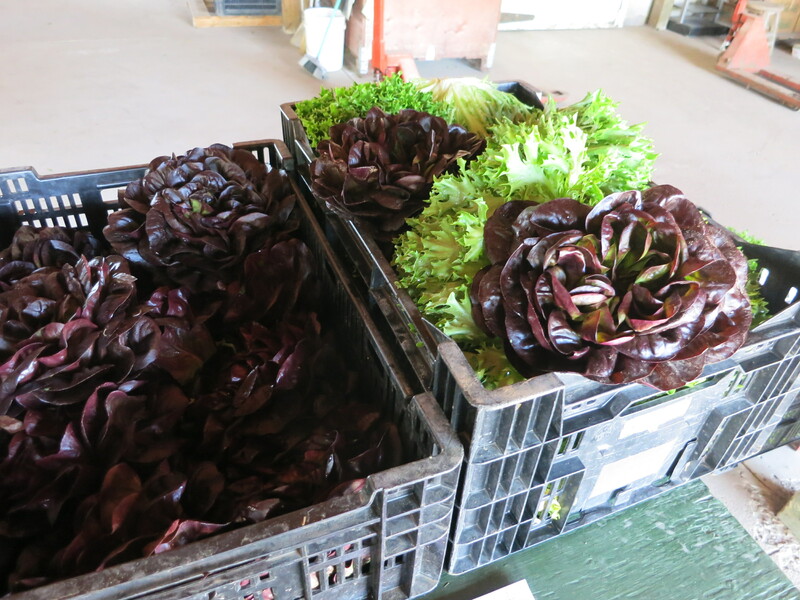 Lettuce, radishes & salad turnips make repeat appearances in the CSA box again this week. 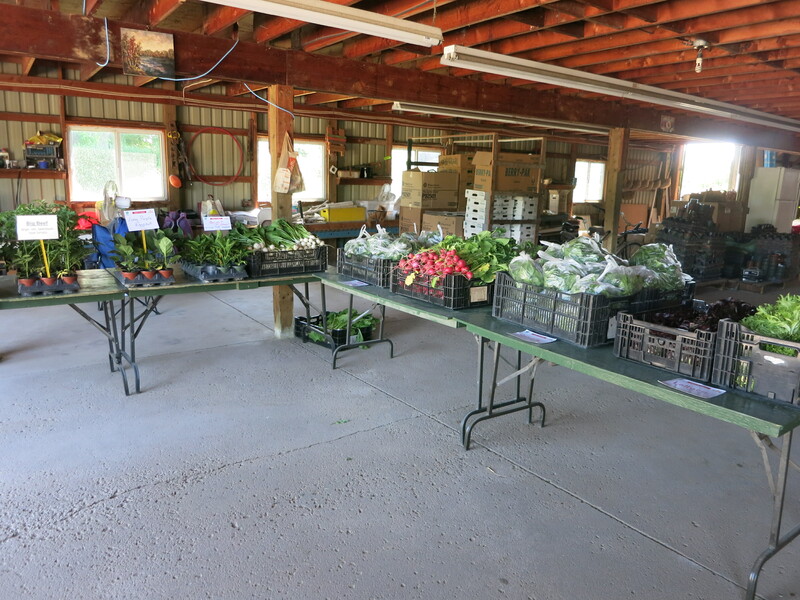 … a few pictures of pick-up day for our CSA last week.